權現領建築研究所 | Gongenryo Architectural Lab. 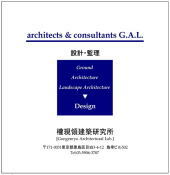 權現領建築研究所　architects & consultants G.A.L. Copyright 2017 Gongenryo Architectural Lab., All rights reserved.